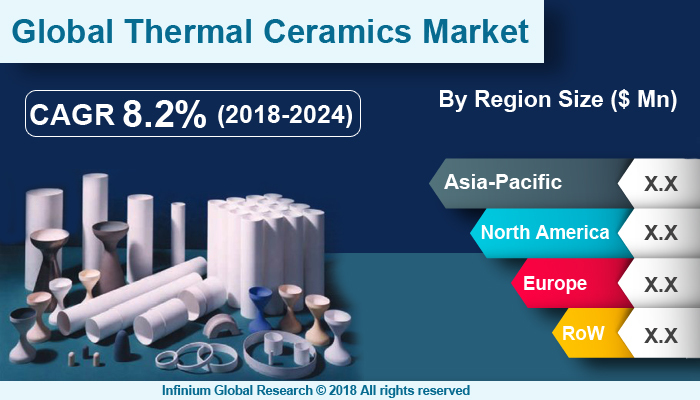 A recent report published by Infinium Global Research on thermal ceramics market provides in depth analysis of segments and sub-segments in global as well as regional thermal ceramics market. The study also highlights the impact of drivers, restraints and macro indicators on the global and regional thermal ceramics market over the short term as well as long term. The report is a comprehensive presentation of trends, forecast and dollar values of global thermal ceramics market. According to report the global thermal ceramics market is projected to grow at a CAGR of 8.2% over the forecast period of 2018-2024. Thermal ceramics are the thermal insulation materials that reduces the heat transfer between objects in range of radiative influence. Thermal ceramics are used as high temperature insulating material across various industries including automotive, aerospace, chemicals and many others. The thermal ceramics have high fire resistance property so they are majorly used in the thermal insulation products to reduce energy consumption and emission in variety of high temperature processing applications. The growing adoption of thermal ceramic materials in various applications including heaters, ceramic kilns, filtration, furnaces and other high temperature insulation applications are driving the growth of thermal ceramics market. The infrastructural developments are growing with the fastest rate especially in the Asia Pacific region that is anticipated to boost the growth of the thermal ceramics market. In addition, rising demand of energy saving applications across the various end-use industries are contributing in the growth of thermal ceramics market. However, Ceramic Fibers has Carcinogenic nature that may promote the formation of cancer that is expected to restrain the growth of thermal ceramics market. Moreover, the several government agencies are enforcing various rules and the regulations that mandate thermal insulation and chemical safety in order to ensure safety and the hazard free working environments at production and processing industries. Ongoing technological advancement in the ceramics and the growing demand of thermal ceramics in metal processing industries are projected to create the various opportunities in the thermal ceramics market in upcoming years. Regionally, Asia-Pacific is the largest and fastest growing region in the thermal ceramics market owing to the rapidly growing chemical industry. Furthermore, growing mining and metal processing activities in the China and other emerging countries creates the high demand of thermal ceramics that is further contributing in the growth of the thermal ceramics market. The report on global thermal ceramics market covers segments such as, temperature range, type and end use industries. On the basis of temperature range the global thermal ceramics market is categorized into 650–1,000°C, 1,000–1,400°C and 1,400–1,600°C. On the basis of type the global thermal ceramics market is categorized into insulating firebricks and ceramic fibers. On the basis of end use industries the global thermal ceramics market is categorized into metal processing, chemical & petrochemical, power generation, mining, manufacturing and others. The Asia-pacific region offers a substantial potential for the market growth owing to rapid growth in markets such as India and China. The APAC region is projected to experience a growth at a CAGR of x.x% over the period of 2018-2024. The report provides profiles of the companies in the global thermal ceramics market such as, Morgan Thermal Ceramics, Yeso Insulating Products, Mitsubishi Chemical Corporation, 3M, Isolite Insulating Products, Luyang Energy-Saving Materials, RHI Magnesita, Ibiden, Unifrax and Rath. The report provides deep insights on demand forecasts, market trends and micro and macro indicators. In addition, this report provides insights on the factors that are driving and restraining the global thermal ceramics market. Moreover, IGR-Growth Matrix analysis given in the report brings an insight on the investment areas that existing or new market players can consider. The report provides insights into the market using analytical tools such as Porter's five forces analysis and DRO analysis of thermal ceramics market. Moreover, the study highlights current market trends and provides forecast from 2018-2024. We also have highlighted future trends in the thermal ceramics market that will impact the demand during the forecast period. Moreover, the competitive analysis given in each regional market brings an insight on the market share of the leading players. This report will help manufacturers, suppliers and distributors of the thermal ceramics market to understand the present and future trends in this market and formulate their strategies accordingly.